I was on the phone the other day with a client of mine, a nice guy in his early 40s, and we were discussing what to talk about on a first date, in response to some feedback he received from a recent date of his. His date said she felt like she was driving the whole conversation, and when she left room for him to come up with a new topic, he, unfortunately, dropped the ball. When I asked my client if he felt that was the case, he told me that he thought his date should be talking more at all costs for some reason. I said that even if that were the case (which it’s not), she still needed some prompting. What made you decide to move to the [insert your city here] area, and how do you like it? What kinds of things do you like to read for fun? Have you read anything good lately that you would recommend? Remember that this is a date, not an interview, so try to avoid acting like you’re judging the other person based on his or her answers. (Maybe you are, but keep that to yourself!) Don’t put the person on the spot. Rather, ask something that he or she already knows or can at least have a fun time thinking about. Now, let’s say you’ve used the “What do you like to do after work?” question to get the ball rolling. I call this a Level I question. (There may, in fact, be a real term for this… I just don’t know it!) Level I questions start with completely new topics and are fairly general. They usually can be answered with a word or two and not much elaboration. Level II questions are the ones that delve a little bit deeper. Let’s say that your date responds with this: “Sometimes I like to go to the gym, and sometimes I cook dinner.” A great follow-up question would be, “Oh! What do you like to do at the gym? Do you take classes?” Or, “Where did you learn how to cook? Do you have a specialty?” These questions are on the same topic, yet they are one level beyond the original. Level III questions delve even further, often into a person’s feelings about something. Now your date responds with this: “I learned to cook from my grandma, actually. She moved here right from Italy.” You could then say, “Wow! If you still have family in Italy, how do you enjoy visiting them?” This question elicits more than a one-word answer. It makes your date actually think about his or her answer, hopefully in a positive way. As an exercise, try having a conversation with someone where all you do is ask questions. Tell him or her not to ask you anything, so that way, you’re the one who has to constantly drive the conversation. It’s tiring, isn’t it? But it’s also great practice for making sure you always have something else to ask. In general, there are no right or wrong questions to ask on a first date (just please don’t ask, “Why are you single?”). What’s more important is that you engage the other person and make sure there’s a give and take. I know my client will be fine on his next date now that he’s aware of some pointers to help the conversation flow. Keep in mind that it takes two to tango, just as it takes two to have a conversation on a first date. 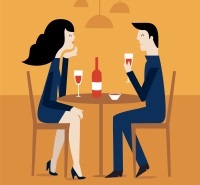 If you’re curious, feel free to read more expert advice about five questions you shouldn’t ask a woman on a first date.